When the world needed heroes, we got these guys. In this Lord of the Rings–style quest, a timid dog named Doogal (Tay) and his merry band of adventurers — Dylan, Brian and Ermintrude — must find three legendary stones that, if united, will enable their possessor to rule the world. But the evil wizard Zeebad wants the stones, too. $3.605 million on 2318 screens. After Hoodwinked received weak reviews, I figured it was a flick to avoid. However, I took a look at the DVD anyway and found it to offer a surprisingly clever and amusing piece of work. Doogal followed hot on its heels with even weaker critical notices. Despite that, I wanted to see if lightning could strike twice so I shoved the DVD into my player. 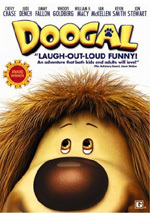 Doogal takes place in “a faraway land where everyone is the best of friends”. We meet a girl named Florence (voiced by Kylie Minogue) and her puppy Doogal (Daniel Tay) as well as Ermintrude the cow (Whoopi Goldberg), Brian the snail (William H. Macy), Dylan the rabbit, and Zebedee the good wizard (Ian McKellen). When Doogal’s mischief causes a candy cart to crash into a carousel, this frees an evil wizard named Zeebad (Jon Stewart). This accident also traps Florence and some other kids in the merry-go-round. Zeebad tries to freeze the world, and he now wants to renew that quest. He needs three magical diamonds and he can rule the world. Aided by a magical train (Chevy Chase), Doogal and the others get the mission to stop Zeebad. They need to find the diamonds first and thwart his evil plan. The movie follows their quest and their attempts to avoid Zeebad. If you don’t like movies chock full of pop culture references, then avoid Doogal. Essentially it packs a slew of these gags and attempts to cobble a story around them. Not that it’s much of a plot, as it borrows heavily from Lord of the Rings and never goes much of anywhere. It exists as a loose framework for jokes and some action. Doogal worries so much about these wacky comments that it doesn’t bother to do much else. The characters exist as narrow clichés for the most part, and they range from tolerable to unlikable. Doogal himself stands as the weakest of the bunch. He’s generally selfish and unpleasant. We know he’ll go through a transformation and learn along the way, but we don’t care; he’s such a brat from the start that it’s next to impossible to maintain any interest in him. If the pop references felt like anything other than tacked on nonsense, Doogal might go somewhere. Unfortunately, there’s really little cleverness on display. It seems like the filmmakers just thought of allusions and threw them in wherever possible. Does it mater if they make sense? Not really. The vast majority will be over the head of the kiddie target audience. They might get some of the comments, but most of them will even zoom past many of the adults. For instance, we get an odd reference to Pulp Fiction when Dylan mutters, “Zeb’s dead, baby – Zeb’s dead”. Just being obscure doesn’t make a joke funny or clever, and quantity definitely doesn’t equal quality. Really, this is nothing more than a really simple fairy tale with lots of cheesy pop culture references packed into it. Oh, and it occasionally throws out a random fart joke. Much of Doogal doesn’t make much sense, and it never turns into a coherent whole. I don’t think it’s as terrible as its reviews indicate, but it’s not a good film. Footnote: fans will want to stick through the end credits. These include outtakes from the voice recording sessions and a small bit at the movie’s very end. 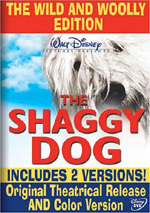 Doogal appears in both an aspect ratio of approximately 1.77:1 and in a fullscreen version on this double-sided, single-layered DVD; the widescreen image has been enhanced for 16X9 televisions. Only the letterboxed picture was reviewed for this article. This was a consistently strong transfer. Colors were another highlight. The variety of settings offered plenty of chances for lively, dynamic hues, and the movie capitalized on them. The hues were always vivid and vibrant. Blacks seemed deep and full. While low-light shots offered great delineation and clarity. The movie consistently looked great. In addition, the Dolby Digital 5.1 soundtrack of Doogal seemed very good. It used all five channels to good effect through much of the movie and created a nicely full soundfield. Elements were appropriately placed and they blended together quite smoothly. The surrounds helped flesh out the package with many unique elements. They brought a lot of good support to the mix. Audio quality was terrific. Speech always seemed natural and concise. Effects were tight and detailed, and they boasted nice low-end when necessary. The music also sounded full and dynamic. This track was consistently quite good. Only a couple of minor extras appear here. The main attraction comes from The Making of Doogal. This 15-minute and 54-second featurette offers the standard mix of movie clips, behind the scenes materials, and interviews. We hear from writer Cory Edwards, executive producer and co-writer Butch Hartman, and voice actors Kevin Smith, Jon Stewart, William H. Macy, Whoopi Goldberg, Jimmy Fallon, Chevy Chase, Daniel Tay, Judi Dench, and Bill Heder. They discuss the characters and vocal performances. We also get notes about adapting the British version of the flick with American voices and some technical remarks about the computer animation. Too many film snippets appear, and a lot of the comments fall into the happy talk domain. Still, I like seeing the actors record, and they give us a decent look at their side of things. Finally, the set includes the theatrical trailer for Doogal and an ad for Hoodwinked opens the DVD. When I went into Doogal, I expected a wholly terrible movie. Although it wasn’t atrocious, it certainly wasn’t good. The film was little more than a loose framework for random gags. The DVD offers very strong picture and audio but skimps on extras. Despite the high quality of the movie presentation, I can’t recommend this weak flick.